Amber Kuo’s princess is officially back! Yang Mi will reprise her role as Lin Xiao in Tiny Times 3.0 (小时代3), the third installment of author/director Guo Jingming‘s series, which is set to air in summer 2014. Most of our favorites from the first two movies will be returning, with the unfortunate exception of Rhydian Vaughan, who will be replaced by Vivian Dawson. 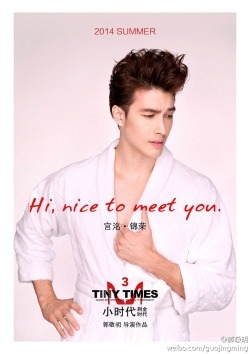 Tiny Times 3.0 will also introduce two new male characters, both of whom are related to Amber Kuo‘s Gu Li. Check out the complete cast listing behind the cut. After almost a month of speculation over whether Yang Mi could fit Tiny Times between her busy filming schedule and her life as a newlywed, Guo Jingming finally announced that his most suitable choice for Lin Xiao would be returning. In the last two installments, Lin Xiao found a weekend job at high-scale magazine M.E., had her heart broken by long-time boyfriend Jian Xi, and found herself falling for eccentric writer Zhou Chongguang… only to find that he was dying from stomach cancer. How will she cope with what life throws at her next? Life threw a lot of hurdles at Gu Li in the previous two movies, from her father dying on her birthday, to her friend upending a wine glass on her head during her birthday dinner, to finding out her mother isn’t her real mother, to a corporate powerhouse trying to buy out her late father’s company, to her boyfriend’s mother trying to interfere with their relationship, to blackmail attempts from a friend’s ex-boyfriend, but the natural businesswoman has stood her ground. Will her fortunes change in Tiny Times 3.0? Tiny Times 2.0 ended with Nan Xiang, Lin Xiao’s artistic and beautiful roommate, urgently attempting to contact her friends while they enjoyed a snowball fight at Zhou Chongguang’s birthday party. Why was she so desperate to reach Lin Xiao? Could it have something to do with her abusive ex-boyfriend Xi Cheng? Badminton star Tang Wanru may have been relegated to comic relief in the last two movies, but we’ll get to see more development from her in Tiny Times 3.0 as she transforms into an attractive beauty who just wants to catch the attention of athlete Wei Hai. Cfensi favorite Kai Ko is back! Gu Yuan was stunned when he discovered that his girlfriend, Gu Li, had slept with another man, and it seemed like they had officially gone splitsville in Tiny Times 2.0, but the power couple isn’t that easily knocked down. Now that they’re together again, what will they get up to this time? The last time we saw him, Zhou Chongguang was enjoying a snow-filled party with his brother Gong Ming, his sorta-girlfriend Lin Xiao, and some of their friends. Can the cancer-stricken writer stretch out his happiness a little longer, or will this be the last birthday party of Chongguang’s life? Replacing Rhydian Vaughan will be Vivian Dawson, an Australian model whose only claim to fame is being Jolin Tsai‘s boyfriend. Do you think he can pull off acting Lin Xiao’s austere, neat freak, germaphobic boss? Taiwanese model-turned-actor Ren Youming joins the cast as Gu Zhun, the illegitimate younger brother of Gu Li. Movie Gu Zhun will actually be an amalgamation of two characters in the original novels: himself and Lan Jue, a young man who serves as Gu Li’s personal assistant and finds himself as Neil’s object of affection. Neil is Gu Li’s flamboyant half-Chinese, half-white younger cousin (on her mom’s side, so no blood connection to Gu Zhun) who has an uncanny ability to push Gu Li’s buttons. Nevertheless, his good looks are a natural cause for adoration from Lin Xiao and the other girls. Neil will be portrayed by half-Korean, half-white model Lee Hyunjae, who also serves as the drummer for a band called MATE. Xi Cheng, Nan Xiang’s abusive ex-boyfriend, is up to no good again in Tiny Times 3.0. Will he continue blackmailing Gu Li? Is he the one Nan Xiang turned to after she ran away from home? What other dastardly deeds is he capable of? Hello, Kitty! Gong Ming’s impossibly capable assistant is back, with the same level of subtle snarkiness that we found so endearing in the first two movies. Now that she’ll be working full-time with Lin Xiao, we’ll likely see more of her and find out whether she is really Lin Xiao’s friend or foe. You may have thought that Ye Chuanping, Gu Yuan’s domineering and bossy mother, was out of the picture after she unsuccessfully attempted to foil Gu Li and Gu Yuan’s relationship by forcing her son into a marriage with a business friend’s daughter. But Ye Chuanping is Ye Chuanping… she’s not done with the story until she says she is. What other plans will we see from her this time? This entry was posted in Mainland China, Movies and tagged Amber Kuo, Bea Hayden, Chen Xuedong, Guo Jingming, Jiang Chao, Kai Ko, Kiwi Shang, Lee Hyunjae, Ren Youming, Rhydian Vaughan, Tiny Times 3.0, Vivian Dawson, Wang Lin, Xie Yilin, Yang Mi by Jo. Bookmark the permalink. Tiny times 3 was such a disappointment. There are so many questions from Tiny Times 2.0 leading up to this movie that are not addressed. And this movie uses the same formula as Tiny TImes 2.0…a huge fallout between the girls and also the boys once again. But somehow they forgive each other and all is well…. yet again. The movie was all over the place…and omg how could they replace Rhydian Vaughan! x_x. Tiny times 1.0 is still the best so far… I just loved how this movie started off. I wonder what Tiny Times 4.0 will bring. i’m late in replying but still wanna comment because i just totally got into this and loving everything aspect despite the confusing parts of some things. sad that Rhydian isn’t reclaiming his role and hopefully Vivian can do a good job of acting? because i don’t know much about him except the whole Jolin boyfriend thing. Anyways, glad to see that majority of the same cast are still here though. can’t wait for this to release and hopefully english subs once again!! =] thanks a lot! Why is Rhydian Vaughan leaving … :( ? idarklight’s the authority on this, but Neil is mixed for sure. I’m pretty sure Gong Ming is mixed, because his dad is the head of Constanly Corporation or whatever, but I can’t remember if it says so explicitly in the books. I don’t know if we find out who Gu Li and Gu Zhun’s real mom is, so they could be mixed too. Although Amber Kuo definitely doesn’t look mixed at all, so idk why they picked someone like Ren Youming to be her little brother. I think Neil is the only mixed one. Constanly is notable for being a Chinese corporation that succeed in the US market, so I think his dad should still be Chinese. Gu Zhun is suppose to look pretty similar to Gu Li, so probably not mixed. So did Gong Ming’s dad pick an American-sounding surname for his company? I just assumed he was American and picked out a Chinese surname, but I guess it works both ways. I’m looking forward this movie! Wow I love this format. It’s perfect for this kind of post. Also props for putting this up so fast! I’m happy most of the original cast is back! No news on the poor guy who no one remember that plays Jianxi yet? LOL he was so bland in the first two movies… it’s no wonder no one remembers him. I love the way this page is set up!! <3 It's so much easier to read. She does look different, but they have the same name, so it should be the same person. Her bangs got changed (they used to be straight down in front of her forehead), but it’s the same actress. okay, so excited now~ sad about rhydian (why would he turn this down D:) but yay, kai ko!